Rosa Parks' refusal to recognise segregation, the Montgomery bus boycott of 1955, and the passing of a bill to recognise Martin Luther King Jr Day as a national holiday. Do spontaneous protests occur? Alistair Cooke explores Rosa Parks' infamous bus ride. The 25th anniversary of the desegregation of the University of Alabama. A collection of programmes and content marking Black History Month. Ronald Reagan’s presidency, from Reagonomics to reconciliation with the Soviet. 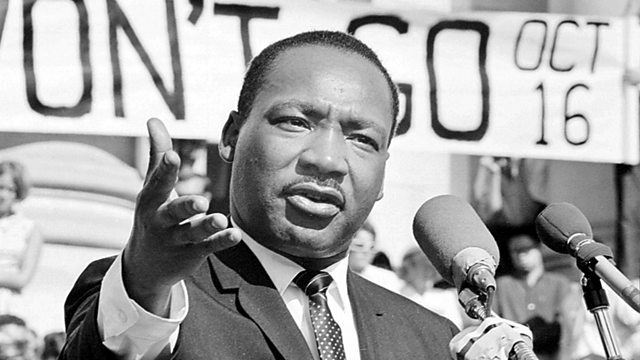 50th anniversary of Martin Luther King's 'I Have A Dream' speech: programme selection. From Halloween to Columbus day, how Americans celebrate and commemorate events. The issue of race in the United States explained by Alistair Cooke. Why do Americans love their flag? How The Stars and Stripes became an emotional symbol of a nation. The best of Radio 4: opinion pieces, history, international reporting, books and culture.